Two. That's the number of votes a bill to label genetically engineered (GE) foods recently fell short of in the California Senate. And not for lack of trying, or lack of public support. A powerful coalition of moms, farmers, businesses and public interest groups joined together to push the bill forward; they filled the capitol halls, offices and phone lines of state senators for days leading up to the vote. After several attempts to bring SB 1381 to a vote on the Senate floor, including convincing several senators to abstain from voting, it narrowly failed to pass. Still, the movement to label GE food in California and beyond shows no sign of slowing or backing down. An overwhelming majority of Americans, including Californians, remain committed to a better understanding of what's in their food and how it's grown. In fact, a new Consumer Reports poll released this week shows consumer demand for labeling is stronger than ever. A full 92 percent of those surveyed in the national poll said they think GE food (or GMOs) should be labeled before being sold. Labels allow us all to make choices about what we serve our families and what sort of food system we support. And I've long argued this to proponents of GMOs: If you support your product, stand behind it. Let's have a more transparent conversation about the direction of our farming system, starting with crops engineered to withstand an ever-growing amount of pesticide use. While the California bill (SB 1381) was limited to labeling, you wouldn't know it if you spent any time listening to high-powered lobbyists. The capitol halls were aflutter with misinformation (including an unattributed flyer circulated by opposition to the bill). And the usual suspects -- including Monsanto, Syngenta, DuPont and their front group the Western Plant Health Association -- were lobbying against the bill. Notably, in the first set of disclosures this year, this was the only bill pesticide/GE seed giant DuPont lobbied on. In light of this campaign of misinformation, California legislators who voted for the bill, especially the bill's author, Senator Noreen Evans, deserve praise. They stood their ground, aligned with public opinion, even while faced with strong industry lobbying efforts and misinformation campaigns. And supporters of GE labeling show no signs of giving up. A similar bill continues to move forward in New York, while citizen initiatives are advancing in Oregon and Colorado with public votes slated for November. And the strong coalition in the Golden State is already planning for what comes next. No doubt the opponents of GE labeling, and a sustainable food system, will continue to push back. There are already signs that they're mounting an aggressive counterforce through various front groups, including U.S. Farmers and Ranchers Alliance, which just produced a feature-length film to challenge the success of the hard-hitting films like Food, Inc.
And in California, those opposition efforts have seeped into academic institutions, attempting to reframe the research and the conversation. The University of California, Davis (my alma mater! 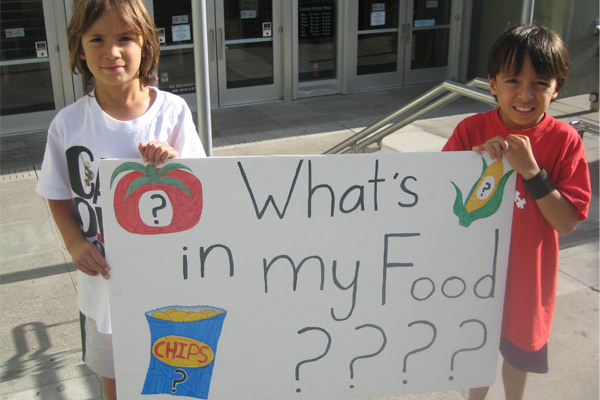 ), and also home to the cutting-edge Agriculture Sustainability Institute, is already tracking "anti-GMO" activity in the state and has several joint projects with Monsanto, Bayer and other pesticide and genetically engineered seed corporations. But it doesn't stop there. No doubt we'll hear a lot more about the value and importance of GE crops, as the so-called World Food Center based out of UC Davis -- led by Monsanto-tied Roger Beachy -- is considering setting up shop just blocks from the capitol and state regulators. Corn, cotton and alfalfa are the most widely grown genetically engineered crops in California but pale in comparison to the vast acreages of these commodities grown in the Midwest and South. As has been pointed out on many occasions on this blog, herbicide-resistant GE crops have driven up pesticide use by hundreds of millions of pounds over the last almost two decades of commercialization. Over the past few months, opponents to SB 1381 kept arguing that the bill would limit the ability of farmers of certain crops, like citrus and grapes, to effectively address new pest problems. I was struck by the reductionist thinking of those industrial agriculture lobbyists I encountered. Without question, we need better tools than we currently have. But the answer isn't the introduction of (a) more harmful pesticides (including neonicotinoids that harm bees) or (b) genetically engineered crops to address these pests. Both options ignore the vast opportunities for feeding the world through healthy, resilient agriculture that spurs new practices, technology and knowledge. But most Californians haven't been given a choice to participate in a dialogue or shape the future of GE crops in the state. By halting the advance of SB 1381, Monsanto & Co may have killed a bill -- but they've only prolonged the inevitable march to a more democratic, sustainable food system.